The PDP describes Wike's victory at the Rivers Governorship election as victory for the people of Rivers State and the triumph of good over evil. Gov Wike record of 700,000 votes margin of victory over the disgraced combined anti-people forces of the APC and the African Action Congress (AAC) and compromised security agencies speaks volume of the resilience of the people of Rivers State in the face of intimidations, harassment and manipulations by oppressive forces. The victory reinforces the confidence of the people in the resoluteness of asserting their democratic choice of leadership as well as standing in defence of their mandate to the end. 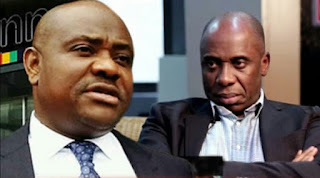 It also demonstrates that the will of the people will always prevail against every form of suppression as were eminently manifested in the desperation by the APC leaders, particularly, the Minister of Transportation, Rotimi Amaechi, to forcefully and violently take over control of the state against the wish of the people. The party salutes and venerates all compatriots who were killed by agents of the oppressors during the election. These compatriots did not die in vain and those who shed their innocent blood will surely be brought to book. The PDP commends Wike, the people of Rivers State and all lovers of democracy across the board for standing firm until the very end to hand this disgraceful defeat to the enemies of the people.